My name’s Debbie Manber Kupfer. I’m originally from London, but today live in St. Louis, MO. When I’m not writing fiction I write puzzles for puzzle magazines and for my blog, Paws 4 Puzzles. I live with my husband, two kids, and the real ruler of our household, our kitty Miri Billie Joe. I believe with enough tea and dark chocolate you can do anything! I love fantasy, because it means I get to dream for a living! I’m mostly a pantser, or as I prefer to call it a “discovery writer”. I usually have a general idea of where I’m going in a story, but until I sit down and write it I have no clear idea how I will get there. The surprises along the way. For example my villain, Alistair, in P.A.W.S. was not in my original idea for the story, but a few chapters in he arrived and made the story all about him. I love surprises like that and am excited to see where my characters take me next. Not sure I could do that! My writing and my puzzles are a huge part of who I am. Before I settled into my current life I worked in many different jobs including secretary, teacher, community worker, and market researcher. They were all just that though, jobs. Writing (and editing, which I also enjoy) make my life much more fulfilled so I doubt if I ever could go back to my previous life. Breakfast – I love breakfast foods and could eat them for every meal of the day. I also enjoy breakfast very much when I travel. In England they make a wonderful vegetarian breakfast that I adore and in Israel (where my mother lives) they serve a breakfast platter filled with cheeses, eggs, breads, salads and all kinds of other delights. It’s making me hungry just thinking about it. I don’t have a huge preference as I enjoy writing a variety of characters and P.A.W.S. has a big and ever growing cast of players. The only conscious decision about the gender of a character I made was Jessamyn, the leader of the St. Louis P.A.W.S. Institute. It occurred to me that they main mentor/teacher characters in fantasy are usually male – think Dumbledore or Gandalf – so I decided I would like to have a strong female leader for P.A.W.S. I want “Mary Poppins” power – the power to snap my fingers and have the house miraculously clean itself. And then once the mess is cleaned I’d have much more time for my writing and puzzles! I love big cities and London and New York are my favorites. The ideal location to write is in a diner or coffee bar in London or NYC where I can watch the world go by. I do some of this in St. Louis, but it’s really not the same. My favorite review is one that’s not published – a teen who read P.A.W.S. before it was published told me that although she enjoyed Harry Potter, she’d never wanted to go to Hogwarts, but she wanted to go to P.A.W.S. – who wouldn’t? Loved that so much. My latest release was this September 1st (so it’s out now). This is the second edition of P.A.W.S. with a new kickass cover from the amazing Rachel Bostwick and bonus bits. Be sure to come back to read more about Debbie and P.A.W.S. on Wednesday’s Karen’s Killer Book Bench. Happy Reading! Links to Debbiew’s website, blog, books, etc. 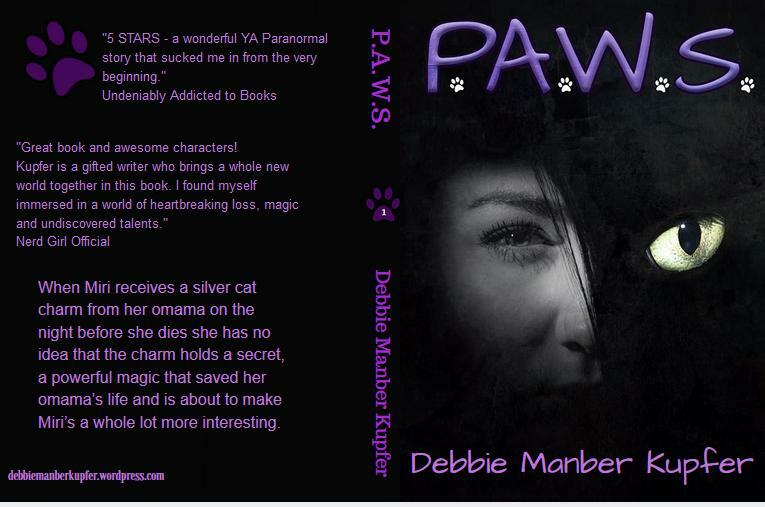 **SPECIAL GIVEAWAY**: Debbie is giving away an ebook of P.A.W.S. to one lucky reader who comments on her **Author Peek** Interview or Karen’s Killer Book Bench blogs. Don’t miss the chance to read this book! Thanks, Debbie, for sharing your story with us! Good morning, Debbie, and welcome to Karen’s Killer Book Bench! Like you, I enjoy the surprises that crop up in my stories although I’m a motley mix of pantser and plotter. Thanks for sharing with us! Good morning to you too Karen and thank you so much for having me on your blog. Great interview! Thank you for the introduction to Debbie. I love reading these interviews of Debbie. Something different is asked each time and I get to learn a little more about her. I love her comment about breakfast, because I often get kidded about eating the Israeli breakfast for lunch, but it is such a wonderful meal. Remind me to take you out for breakfast next time I see you in Israel!